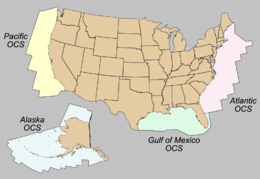 For the generic geographical term, see outer continental shelf. Louisiana is extended 3 (pre-1954 U.S.) nautical miles (5.560 km; 3.455 mi) seaward  of the baseline from which the breadth of the territorial sea is measured (as defined pre-1954 in the U.S.: nautical mile = 6080.2 feet). All other States' seaward limits are extended 3 international nautical miles (5.556 km; 3.452 mi) seaward of the baseline from which the breadth of the territorial sea is measured. Coastlines are emergent coastline. Thus the landward boundary of the outer continental shelf is a legal construct rather than a physical construct, modified only at intervals by appropriate processes of law. ^ "43 U.S. Code Chapter 29 - SUBMERGED LANDS". cornell.edu. Archived from the original on 2011-11-14. ^ a b c d "The Bureau of Ocean Energy Management, Regulation and Enforcement HomePage". mms.gov. Archived from the original on 2007-11-20. ^ Rivet, Ryan (June 2008). "Petroleum Dynamite". Tulanian. pp. 20–27. Archived from the original on 2010-06-13. Retrieved 7 Sep 2009. Under its original acquisition terms with the federal government in 1803, Louisiana’s mineral rights extended out for only three miles. When [the Federal government was] approached by the [Louisiana governor Earl] Long administration [in 1948], the federal government said it was willing to discuss a compromise and split of the royalties in the area beyond three miles. ... [Ultimately,] Truman [said no]. ^ a b "OCS Lands Act History". boem.gov. Archived from the original on 2013-05-03. ^ Who is the Minerals Management Service? Archived 2010-06-03 at the Wayback Machine, U.S. Department of the Interior, accessed 2010-06-13.